Jan. 26, 2018: Amateur astronomer Scott Tilley has a hobby: He hunts spy satellites. Using an S-band radio antenna in Roberts Creek, British Columbia, he regularly scans the skies for radio signals from classified objects orbiting Earth. Since he started 5 years ago, Tilley has bagged dozens of secret or unlisted satellites. “It’s a lot of fun,” he confesses. In a stroke of good luck that has dizzied space scientists, Tilley found IMAGE, a NASA spacecraft that “died” more than 10 years ago. An artist’s concept of IMAGE flying over Earth’s north pole. Short for “Imager for Magnetopause-to-Aurora Global Exploration,” IMAGE was launched in 2000 on a flagship mission to monitor space weather. 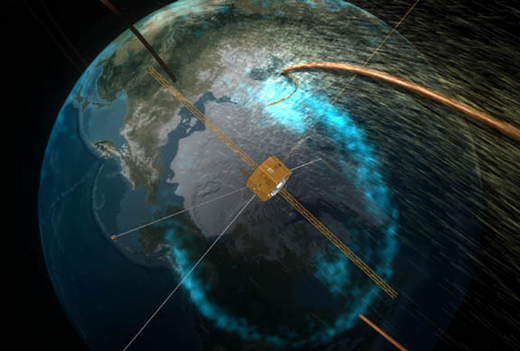 Mapping the ebb and flow of plasma around Earth, IMAGE was able to watch our planet’s magnetosphere respond almost like a living organism to blasts of solar activity, while its ultraviolet cameras took gorgeous pictures of Earth’s global auroras. “It had capabilities that no other spacecraft could match–before or since,” says. Patricia Reiff, a member of the original IMAGE science team at Rice University. IMAGE was in the 5th year of its extended mission on Dec. 18, 2005, when the spacecraft suddenly went silent. No one knows why, although suspicions have focused on a power controller for the spacecraft’s transponder, which might have temporarily failed. The one hope was a reboot: When IMAGE’s solar-powered batteries drained to zero during a eclipse by the Earth, onboard systems could restart and begin transmitting again. “If revival occurs, the mission should be able to continue as before with no limitations,” noted NASA’s IMAGE Failure Review Board in their 2006 report. A deep eclipse in 2007, however, failed to produce the desired result. “After that, we stopped listening,” says Reiff. That is, until Scott Tilley started looking for Zuma. “When I saw the radio signature, I ran a program called STRF to identify it,” he says. Developed by Cees Bassa, a professional astronomer at the Netherlands Institute for Radio Astronomy, STRF treats Earth-orbiting satellites much like binary pulsars–deducing their orbital elements from the Doppler shifts of their radio signals. 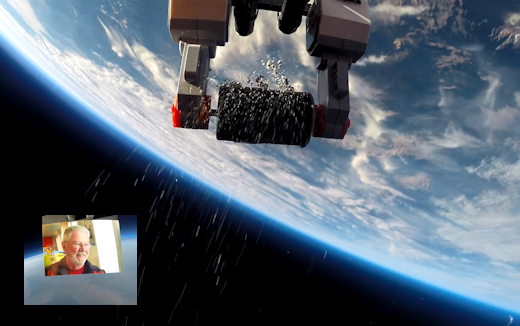 “The program immediately matched the orbit of the satellite I saw to IMAGE. It was that easy,” says Tilley. Sometime between 2007 and 2018–no one knows when–IMAGE woke up and started talking. Now, NASA has to find a way to answer. Jan. 22, 2018: For years, Spaceweather.com and the students of Earth to Sky Calculus have been flying balloons to the stratosphere to monitor cosmic rays penetrating Earth’s atmosphere. Lately, we’ve been flying the same payloads onboard airplanes. We want to map Earth’s radiation environment at aviation altitudes where millions of people are routinely exposed to elevated levels of cosmic rays. In one way, this beautiful curve is no surprise. We expect dose rates to reach a low point near the equator, because that is where Earth’s magnetic field provides the greatest shielding against cosmic rays. Interestingly, however, the low point is not directly above the equator. A parabolic curve fit to the data shows that the actual minimum occurred at 5.5 degrees N latitude. Is Earth’s “radiation equator” offset from the geographic equator? Very likely it is. Earth’s magnetic field is tilted with respect to Earth’s spin axis and, moreover, there are many inhomogeneities in our planetary magnetic field that may create radiation zones of interest in unexpected places. We are now planning additional trips across the equator to map the band of least radiation girdling our planet. 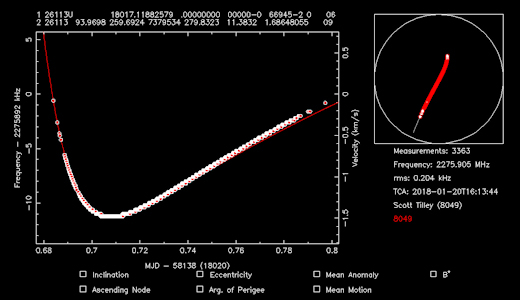 In fact, we are working on a dataset now that includes an equator-crossing between the USA and Chile. Stay tuned for updates. Jan. 14, 2018: In August 2016, geologist Lee Allison, the director of the Arizona Geological Survey, passed away. On Dec. 31, 2017, the students of Earth to Sky Calculus flew his ashes to the stratosphere using a robotic ash scatterer. The space weather balloon flight, which also gathered data on atmospheric radiation, was sponsored by Lee’s wife Ann Becker to honor Lee and mark the sky-high impact he had on colleagues, students, friends and family. “Lee was always interested in space,” says Ann, “and like a lot of us who grew up with the space program, he always wanted to go into space. Funding a balloon flight and spreading his ashes in the stratosphere are definitely things he would have appreciated. “I grew up in central Wyoming. Our 9th grade earth science teachers conducted field science programs (geology and botany mostly) in the summer. I think science programs outside the normal school day can change a young person’s trajectory. They certainly changed mine. Ultimately I studied geophysics and earned a PhD in seismology. “I remember something my high school senior year AP calculus teacher said (1969, right after the Apollo 11 mission): that the boys in the class were the astronauts of the future, and the girls would be their wives and support them. I’m pleased that times have changed, pleased that there are programs like Earth to Sky Calculus that make it easier for young women to not bury their intelligence or interests because society says they’re supposed to.